Justine put her fists on the bed and dipped her head until they were cheek to cheek. Turning to face him, she let her lips skim across the stubble on his cheek. A short sound escaped him at the touch. So like a growl, it inflamed her. She’d wanted to experience all of him, to touch and taste, a savage need to possess him took over. To take his mouth, to take him inside of her, until she drove all thought from him, the way he’d done to her. His scent flooded her senses, leaving her breathless, as she sought his kiss. He pulled back to look at her, his eyes as unreadable as ever. He lifted his hand to her cheek and stroked her bottom lip with his thumb. “What is it?” she asked, her breath still coming in uneven bursts. “I don’t want to give you the wrong idea.” His hand dropped and he eased himself from the mattress. He crossed behind her, to the door, and she twisted on the bed to look at him. Her robe gaped open with the movement, and she yanked it together with a hand, exposed now. But he wouldn’t meet her gaze, wouldn’t look at her at all, so it didn’t much matter. He looked at the TV, the window, the floor. Everywhere but at her. “About us.” Finally, he let his gaze rest on her. Sawyer spoke her name, his voice soft and full of pity. For her. The door slammed behind him, and she jumped, staring at it for the longest time. She couldn’t get back in that bed, not now. She’d been so foolish, attributing feelings to him he didn’t have, to rationalize her own desires were getting the best of her. Tell the readers a little about you. I’m a former social worker. 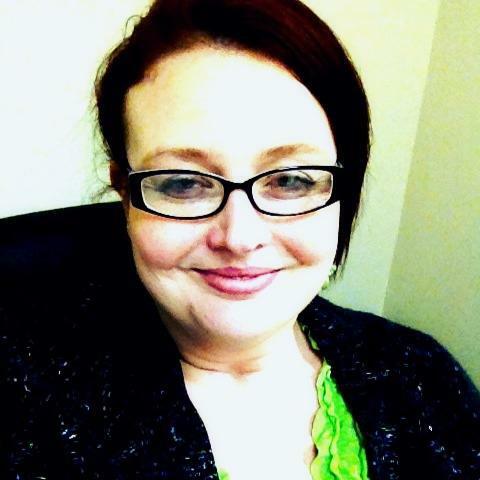 I worked in mental health for ten years and have a B.S. in social and behavioural science, which I think helps me be a better writer. I’ve been married for 20 years and have three daughters. What genre you mostly write in and why? I mainly write contemporary romance with a healthy dose of rom-com. I can identify so much more with the struggles people face today than those of any other time period and I feel like I can tell really crunchy, interesting stories in this genre. 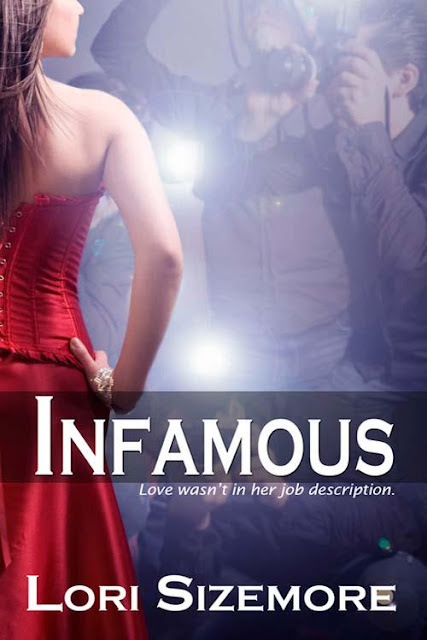 Infamous is my first book. I wanted to write about someone who seemed so unreal and out of touch with reality and show that she’s just a normal person, like everyone else. Her daily struggles came to me as I tried to compare her to what my life or a friend’s life would be like thrust into a situation that made our own painful secrets public fodder. When did you first, without hesitation, call yourself a writer? How much of your books are realistic? While this first book (that’s part of a coming trilogy) is set in a New York television studio with celebrities, I’d still call it a realistic look at life. There are problems, some that all of us face, like paying bills, and others that are more in-character (like how everyone has seen the main character naked and how difficult it is to go to the drug store knowing that). But it’s a real look at life. I just finished Hold Me by Courtney Milan. I felt it was a realistic look at being different, and how that changes everything. Currently, I’m editing the second Infamous book, tentatively titled Unexpected. I’m also editing a trilogy of novellas I wrote set in 1958 Las Vegas. There will hopefully be a lot of new published stories from me in 2017 as these stories finish edits. Writing is my career. It’s my passion as well as the thorn in my side on a daily basis. It’s the best job I’ve ever had and I’m so fortunate to be able to pursue it to the exclusion of other jobs. Everything comes back to family, for nearly everyone. They’re not perfect and sometimes their love can be constricting and hurtful, but if you bang your head on the wall enough, those walls will eventually crumble and you're left with the people who loved you all along. What were your goals and intentions in your books, and how well do you feel you achieved them? My goal is to show real people, with real problems, sometimes serious issues who find out that they’re perfect exactly as they are. It’s to show that love isn’t supposed to change us, but help us be our best selves. I think I achieve that and if I didn’t, I’d consider my story a complete fail. The glamour. I researched real designer clothing, real five-star restaurant menus, real fancy homes in New York. It’s a world away from my daily life, in rural West Virginia. I wouldn’t know a designer tag in my own clothes, but I knew exactly what Justine and company would wear to any given occasion. Lori Sizemore grew up in the mountains of West Virginia and never quite managed to escape them. Lori lives at home with her husband of twenty-plus years and two of her three daughters. She also lives with two dogs, a cat, and five hermit crabs. Yes, five of them. This menagerie and her family keep her busy. She worked in mental health as a social worker for ten years before making the choice to write full-time. Thank you so much for sharing my new release on your lovely blog.